We awoke today in Ogallalla with a firm target of a triangle from Burlinton to Limon to Sterling and on the journey to lunch the SPC introduced a 10% Tornado Risk box. Finally we had a decent risk area today, mid 60’s dewpoints into Eastern Colorado, 55knts of 500mb flow, deep layer shear and easterly surface winds, everything looked ripe for Tornadoes, we also had an Outflow Boundary laid out from yesterdays storms over the Burlington area. If a storm could initiate anywhere near that Boundary then it could be a big day. After grabbing lunch we sat halfway between Yuma and Joes and watched convective initiatioin occur just 12 miles to our South West. 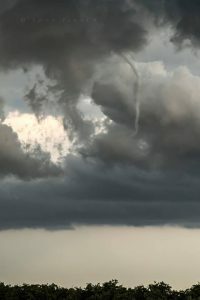 We took a dirt road west to sit right under the base of this storm and on the way a small landspout tornado occured off in the distance to our south-west, what a start to the day already. Radar representation showed this storm was firmly rooted on the boundary and I moved us further South watching 3 areas of rotation, bases were so low there could be Tornadoes and Landspouts anywhere in the Southern or Western sky. 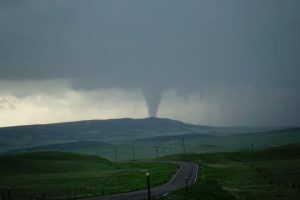 This was turning into a Colorado Magic type of day with a Cyclic Supercell churning out Tornado after Tornado. 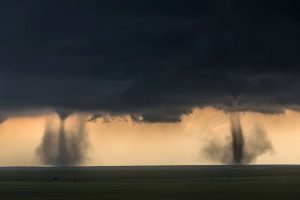 We continued south towards Flagler and the I70 noting another few Landspouts on the way with the closest about 100 yards to our right in a field, all the while the bigger Tornado was still ongoing with satelites to its sides. After about 2 hours of this the storm finally started to to transition to HP and seemed to leave the boundary, it was time for a coffee and fuel up before we headed east to Colby at our overnight stay. 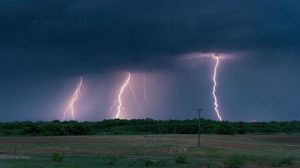 And when we got there we were treated to 6 hours of close Cg lightning all the way through to 5am the next morning. 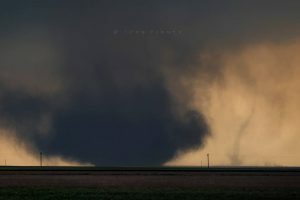 A truly amazing day with 8 Tornadoes from 1 Supercell, when Colorado goes big it sure does like to show off. 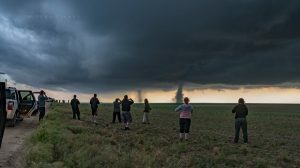 After our travel day to get into position from Elk City to Ogallalla yesterday we awoke finally to a 5% Tornado Risk with better upper support and some impressive moisture in place today would finally see the Season kick up a notch. My target upon waking up was La Grange to Cheyenne and we set off west along I-80. Around lunchtime and after looking at some Surface Obs for some reason I completely changed my mind and favoured NE Colorado, the 50f dewpoints near Cheyenne and NE surface winds were putting me off my initial target and SE winds and Mid 60’s dewpoints looked nice just to my south, so I turned around………….Rule number 1 in storm chasing never change your target area or it will bite you on the arse. 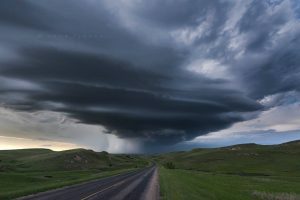 We got onto some nice Supercells all moving North but lacking anything to make them special, and as Models showed very messy in nature so why was I here still when the Storm of the day just 150 miles to my west was now tornado warned. 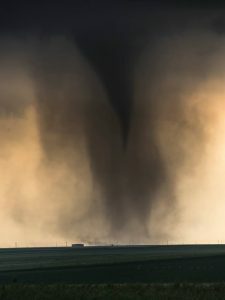 The rest is History as they say, will post a screen grab of Paul Knightleys picture of Wyoming’s Tornado of the year below. Started the day in Burlington with a long drive ahead so it was up at 7am and on the road with a target of Woodward down to Elk City. SPC introduced a small 2% Tornado Risk on the 1630z update so some hope was given but with still no upper support and 25kts of flow once again Tornadoes were going to be hard to come by. 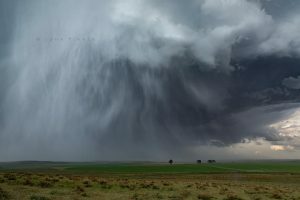 What was an added bonus was some stunning LP Supercell structure today. After visiting the Windmill Farm near Shattuck we headed south to Roll and found a lovely lake to watch developing Cumulus Towers. It was a very slow burner but the Cap broke around 6pm and a beautiful LP Supercell was forming just 20 miles to our west. Roads were very good and the storm was crawling along so we went in a bit closer. The lightning out of the anvil was pretty violent and a few grass fires were noted as we jogged alongside the storm. 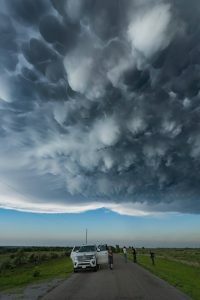 The real winner was the Mammatus under the huge anvil though. Another LP Supercell further South East started to take over so we headed off to get in front of this, we noted several shear funnels with this storm and also a Heat Burst near Sayre when the temperature shot up from 71f to 94f. After punching through the core we came out the other side to a stunning orange glow just before sunset with the Supercell to our west near Mangum. Cg’s still raining down around our ears. Picture above from John Finney. Started the day in Ogallalla and had a target area of Eastern Colorado and Western Kansas. Storms today would have a brief window for Supercell characteristics and a small 2% Tornado window was put out from the SPC. 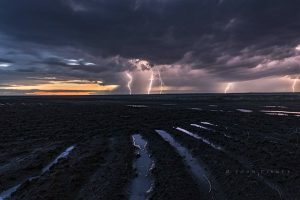 We had lunch in Burlington and it wasnt long before we got onto our first storm near Cheyenne Wells, cored punched a few times and got some close Cg Lightning. We let the mushy line go east and went back North to a pair of LP Supercells near Burlington but it was clear these were struggling against a strong cap. 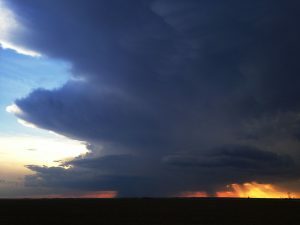 Went east to Kanorado and snapped some shots on the back end of storms moving away to the east. The storm was now starting to turn right to the east and near Chappell it really got its act together and was finally starting to look like a Supercell. 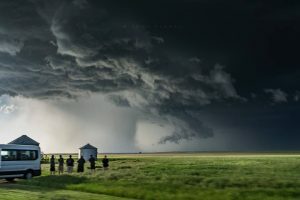 We followed the storm towards Lake McConaughty and just south of there jaw dropping structure was starting to form in front of us. We then went east and North towards the Lake and Dam area and it was here that we really should have got in front of it again and not hung back for Lightning and Mammatus as the structure got even better further east. 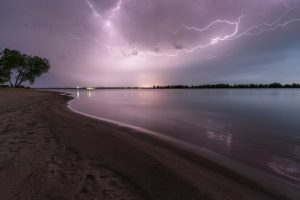 But where else can you finish the day with sand between your toes watching lightning overhead. And all of this in Nebraska. Bigger day tomorrow hopefully in Colorado and Nebraska. After a travel day on Sunday we started in Amarillo with a solid chase target of Roswell. Storms today would initiate over the higher terrain and move off into the Plains into the better moisture. HRRR had a few supercells on its runs and we got to Roswell after a great lunch at the Coffee Bean Cafe in Clovis. Time ticked by and convection did not look like it was going to fire further south so we got suckered north to Vaughn and took a look at a Supercell moving into town. Visually it was unimpressive with a big shelf and cold outflow winds. 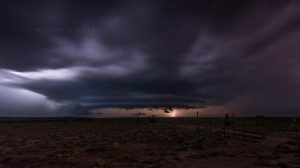 We headed back to end the night in Roswell and let the Storm slam the hotel, some really close Cg bolts rocked the hotel and sent the power off briefly. Some great anvil crawlers were going long into the night and once again John nailed these. Today was changeover day between Tours 1 and 2 and we awoke in Childress which was bang smack in the centre of todays Enhanced Risk. We had to drive back to Dallas pick up and drop off guests and drive straight back up Highway 287 again. 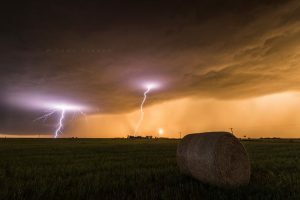 The better risk for Supercells and Tornadoes would be further north today and out of our reach but we did have the fall back on east moving storms moving towards us as we went North West up Highway 287. 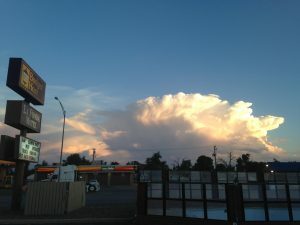 We got away from Dallas at 3pm and by 6pm Severe Storms were just west of us near Vernon. We headed south from Vernon and watched a line of 3 storms move towards us. The structure was still just good enough before it was starting to line out like the models showed. 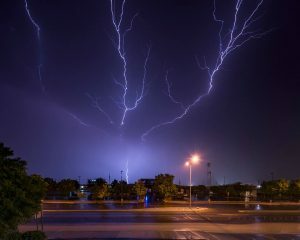 We then moved south and east towards Wichita Falls to get in position for some lightning shots before eating at Applebys. The storms took an age to get to us at the hotel but when they did the storms went on into the early hours. We awoke in Liberal for the final chase day for Tour 1 knowing that we could not get suckered too far north due to the changeover day tomorrow in DFW. 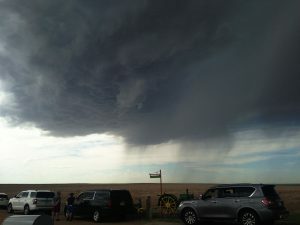 Around 3pm a Severe Thunderstorm Watch was issued and after a nice lunch in the Cattlemans Steak House in Canadian we set off for the Pampa area where the dryline was converging and that was where it looked like initiation would occur. We got onto the first storm of the day which quickly became a Supercell and viewed some nice lightning from Miami. Other storms had now popped off along the dryline and the top one went Tornado Warned so we gave it a chase upto Perryton but it quickly became clear the storm was very High Based so left it and headed back to the Tail end Charlie Supercell which itself was still really high based no surprise with 95/59 spreads in the Panhandle. 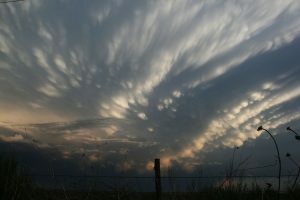 Around 8pm and with activity waning we started our long journey back south, booked rooms in Childress and Tour 1 ended their chase with some amazing Mammatus. A great Tour 1 with some challenging synoptics and no real classic looking chase days. 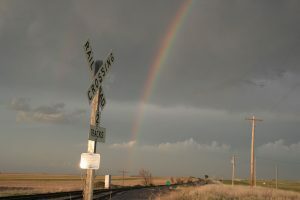 We chased in 7 States and did 4,065 miles, we saw 1 Tornado and the biggest Hail we saw was Baseball. Started today in Lamar with high hopes of something decent rolling out of SE Colorado and into the better moisture in Kansas, but this day really underperformed in a big way. Left Lamar around 11am and grabbed a quick lunch, went South to a rest area and watched an area of convergence build into a storm. It was clear to see this storm was having big issues with low level moisture and the steering flow was taking it almost due North which was not helping as well. We stopped just south of Lamar for a structure shot. Off to our SE big towers along a boundary were keeping our interest though and it was this area of storms we went for when our storm died shortly after the above image was taken. 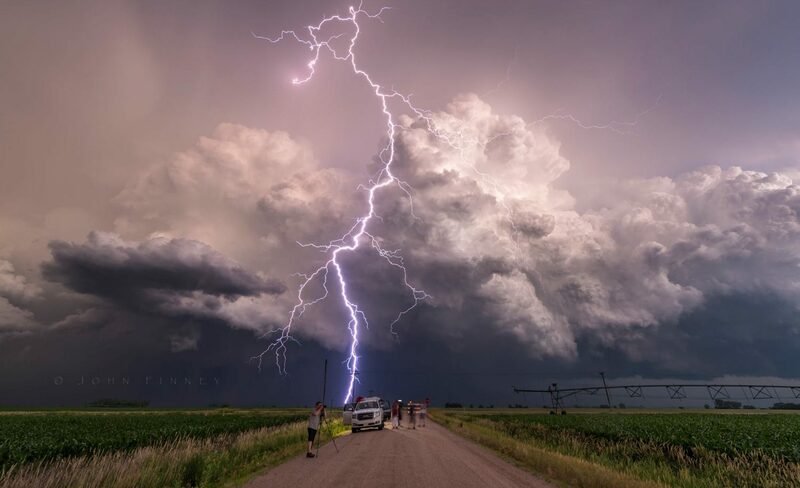 It was always going to be a long shot and we finally connected with the storm just south of Hugoton (Ks) but by this time the storms were pulsing down. A very frustrating chase day in the end.